Low-carbon hydrogen has the potential to play a significant role in tackling climate change and poor air quality. This policy briefing considers how hydrogen could be produced at a useful scale to power vehicles, heat homes and supply industrial processes. These methods typically use heat and fossil fuels. Steam methane reforming is the dominant commercial technology, and currently produces hydrogen on a large scale but is not currently low carbon. Carbon capture is therefore essential with this process. Innovative technology developments may also help and research is underway. Alternative thermal methods of creating hydrogen indicate biomass gasification has potential. Other techniques at a low technology readiness level include separation of hydrogen from hydrocarbons using microwaves. Electrolytic hydrogen production, also known as electrolysis, splits water into hydrogen and oxygen using electricity in an electrolysis cell. 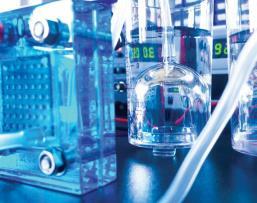 Electrolysis produces pure hydrogen which is ideal for low temperature fuel cells for example in electric vehicles. Commercial electrolysers are on the market and have been in use for many years. Further technology developments will enable new generation electrolysers to be commercially competitive when used at scale with fluctuating renewable energy sources. Biological routes usually involve the conversion of biomass to hydrogen and other valuable end products using microbial processes. Methods such as anaerobic digestion are feasible now at a laboratory and small pilot scale. This technology may prove to have additional or greater impact and value as route for the production of high value chemicals within a biorefinery concept. A number of experimental techniques have been reported, the most developed of which is ‘solar to fuels’ - a suite of technologies that typically split water into hydrogen and oxygen using solar energy. These methods have close parallels with the process of photosynthesis and are often referred to as ‘artificial photosynthesis’ processes. The research is promising, though views are divided on its ultimate utility. Competition for space will always limit the scale up of solar to fuels. The briefing concludes that steam methane reforming and electrolysis are the most likely technologies to be deployed to produce low-carbon hydrogen at volume in the near to mid-term, providing that the challenges of high levels of carbon capture (for steam methane reforming) and cost reduction and renewable energy sources (for electrolysis) can be overcome.